- With the angiograph we will, for instance, close the blood supply to cancer cells, which will cause their deterioration, or, on the other hand, unclog the arteries after an ischemic attack – explains prof. Wojciech Maksymowicz, Vice-Rector of the UWM for Collegium Medicum, and a practicing neurosurgeon. 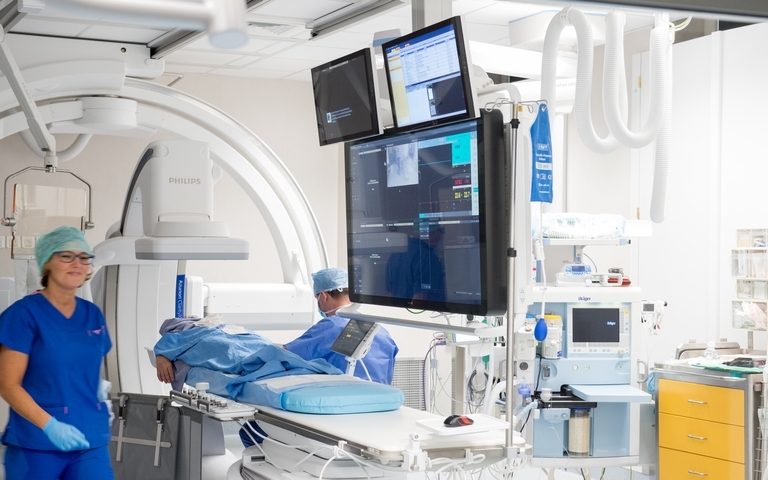 - We already have an angiograph in our hospital, but that device is quite old and generates only flat images. The one we have just bought is the only one of its kind in Poland and the most modern in Europe – adds Dr. Łukasz Grabarczyk MD, PhD, acting USK manager. The angiograph cost PLN 8 million. The purchase was made possible through a nearly 31-million subsidy from the Ministry of Health, which the university hospital received last year towards the purchase of modern medical equipment. Apart from the angiograph, the hospital also bought two MRI scanners (3T and 1.5T). Another new piece of equipment is a Gamma cardiac camera for isotope heart scanning. It will generate very accurate spatial images of human organs. Additionally, the ministerial subsidy has been used to buy two x-ray machines. One is a mobile, self-propelled unit; the other one is basically a camera which x-rays the patient in every possible way and records the generated image and can send over the Internet for a specialist consultation and diagnosis. The hospital has also purchased equipment for the rehabilitation of patients after cerebral strokes, heart attacks, orthopedic operations and traumas.